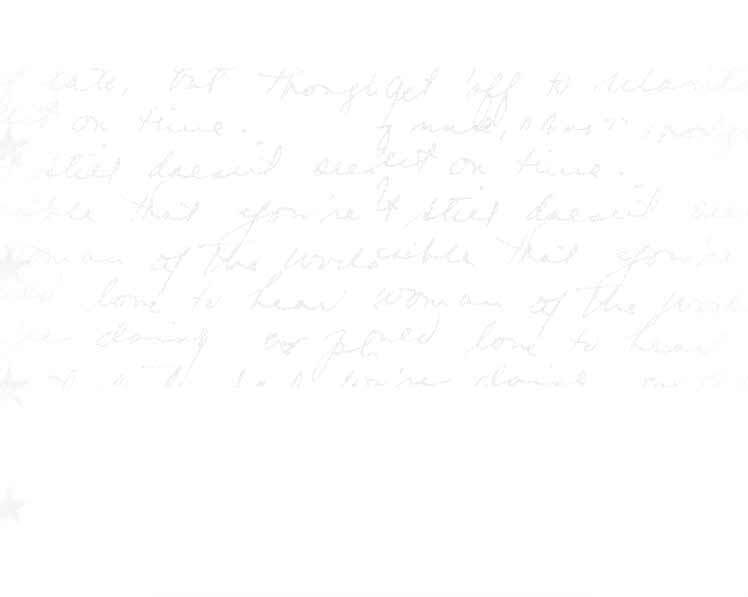 I moved from northern California to New York City at the age of seventeen and became inspired by the burgeoning Downtown 80’s performance art scene where underground luminaries such as Ethyl Eichelberger, Penny Arcade, Eric Bogosian and Karen Finley got their start performing on bombed-out blocks in Alphabet city in venues like 8BC and Limbo. 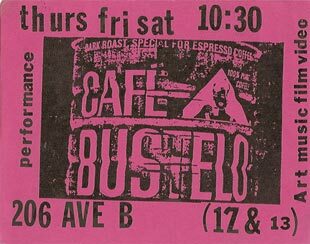 In 1987, I founded the performance space Café Bustelo in the East Village, giving gigs to everyone from the yet-to-be-discovered young John Leguizamo to the venerable Taylor Mead (last seen in the Jim Jarmusch film, Coffee and Cigarettes). Café Bustelo was an alternative community arts space on Avenue B between East12th and East13th streets. 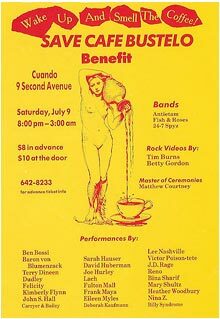 As the director of this non-profit organization, I hosted performances, plays, poetry, music, and street-based film installations. In 1988, with new partners John S. Hall (of King Missile), Terry Dineen, and Dudley Saunders, Café Bustelo relocated to a former synagogue on Houston Street between Norfolk and Suffolk. There we were sued out of existence by three vicious yuppies that closely resembled the ice-cream truck neighbor-vigilantes in the 80’s film, After Hours. 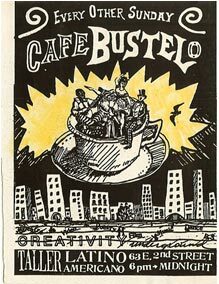 Café Bustelo was reincarnated in 1989 at El Taller/Latin-American Workshop on East 2nd Street between 1st and 2nd Avenues. Located in the basement of a Russian Orthodox Church, Taller hosted Bustelo’s bilingual programs twice monthly on Sundays, until the series died a natural death in 1990.